If ever you happen to be strolling along a Dartmoor lane any time between May and September and happen to notice a small yellow flower growing in a hedgerow then there is a chance that you have just come across Herb Bennet. To be precise the Latin name for the plant is Geum urbanum although as well as being called Herb Bennet it sometimes goes under the name of Wood Avens. Just to throw a couple of more names into the mix the plant is sometimes referred locally to as Ram’s Root or Old Man’s Whiskers (due to the bristly seed head). Herb Bennet is a perennial plant belonging to the rose family and can be found growing near to hedgerows, the edges of woodland and other such shady places. This tiny plant usually stands at a height varying from 20 -70 centimetres. 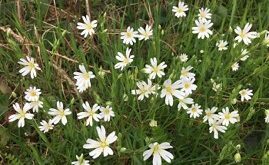 The flowers appear anytime between May and September and are normally 1 to 2 centimetres in diameter and consist of 5 petals. The flowers are hermaphrodite and sweetly scented and are pollinated by bees and other insects. When mature they produce a brown fruit head bristling with tiny hooks which attach themselves to passing animals such a rabbits and other furry animals, it is by this means that the seeds are spread. “It is good for the diseases of the chest or breast, for pains, and stiches in the side, and to expel crude and raw humours from the belly and stomach, by the sweet savour and warming quality. It dissolves the inward congealed blood happening by falls or bruises, and the spitting of blood, if the roots, either green or dry, be boiled in wine and drank; as also all manner of inward wounds or outward, if washed or bathed therewith. The decoction also being drank, comforts the heart, and strengtheneth the stomach and a cold brain, and therefore is good in the spring-time to open obstructions of the liver, and helps the wind cholic; it also helps those that have fluxes, or are bursten, or have a rupture; it taketh away spots or marks in the face, being washed therewith. The juice of the fresh root, or powder of the dried root, hath the same effect with the decoction. The root in the spring time steeped in wine, give it delicate savour and taste, and being drank fasting every morning, comforteth the heart, and is a good preservative against the plague, or any other poison. It helpeth digestion, and warmeth a cold stomach, and openeth obstructions of the liver and spleen. It is very safe; you need have no dose prescribed; and is very fit to be kept in every body’s house.” pp. 21 -22. As you can see Herb Bennett, according to Culpepper, will cure almost any type of illnesses from the plague to flatulence. Despite these exaggerated claims Herb Bennet is still used today by modern herbalists to ‘cure’ amongst many the following; “diarrhoea, dysentery, headaches, sore throats, catarrh, and gastric irritation. These preparations came/come in infusion, tincture, decocoction and cordial forms. Other attributes of Herb Bennet are that the roots can be used as a flavouring for ales when it adds a clove-like taste to the brew and prevents it from turning sour, similarly it can be used to replace cloves in apple pies. If some is placed amongst clean clothes again it adds a fresh, sweetish smell to the clothing and also has the benefit of repelling moths. Sometimes Herb Bennet is referred to as the ‘Blessed Herb‘, this is due to a couple of religious associations. Firstly because of it having a trefoiled leaf and five yellow petals these are said to represent the Holy Trinity and the five wounds of Christ. For this very reason in the 13th century representations of the plant were often depicted in architectural sculptures that appeared on columns and wall patterns in churches. Additionally the plant’s name is said to have derived from a former one – Herba benedicta and because of this holy connotation was said to have the power of warding off the Devil and other evil spirits. It was also believed that a sprig of dried Herb Robert hung up in the house would protect all within from visitations by the Devil and other such evil spirits. This property was first recorded in the Ortus Sanitatis of 1491 where it, stated that: ‘Where the root is in the house, Satan can do nothing and flies from it, wherefore it is blessed before all other herbs, and if a man carries the root about him no venomous beast can harm him.” There is also the theory that the plant’s name is associated with St. Benedict, again with its holy connection giving it protective powers against poisons. There is one story that relates how a monk once gave St. Benedict a beaker of poisoned wine but when the saint blessed the drink the beaker exploded and a demon shot out exposing the evil deed of the monk. There are those who say that due to this ability to protect people from poisons that if one carried some roots of Herb Benedict they should never fear being bitten by a poisonous snake. On Dartmoor this would only apply to the ‘Long Cripple’ or adder.